The previous reading, File Transfer Protocol (FTP) for the Web Author, offers an introduction to FTP. 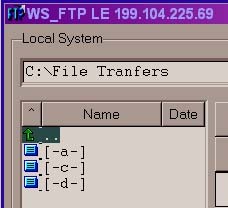 This page is intended to offer specific directions on the use of WS_FTP LE to transfer files to and from a server. 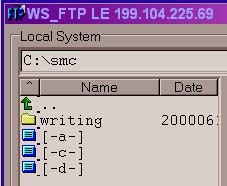 WS_FTP is a PC application. MAC users should use Fetch or a similar MAC FTP program. Academics and students can download a FREE copy of WS_FTP Limited Edition from the IPswitch Web pages, or from FTPplanet. Directions for installing WS_FTP are also available on-line. Some web authoring tools, such as Dreamweaver, have built in FTP capabilities. File transfers are made in many circumstances not related to web publishing, so a stand alone FTP program is a valuable tool and knowledge of its use is a valuable skill. Directions for Using WS_FTP LE. Open WS_FTP LE. (The installer places a shortcut on your desktop and in Start > Programs > WS_FTP.) The Session Properties dialog box appears. 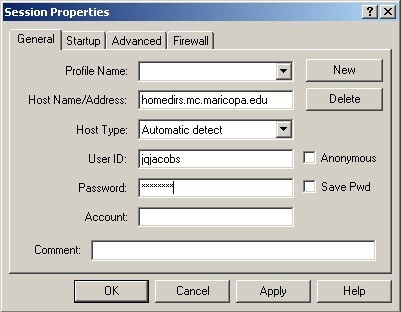 The information filled in below uses the Host address, User ID and Password for my Mesa Community College account. The IP number or Domain Name of the remote computer is placed in the Host Name/Address window. If you FTP to several servers you can create a profile for each and later select your profiles from the Profile Name drop-down menu. To create a new profile select the New button. Thereafter, when you select your profile name the remainder of the information will automatically be filled in. After input of your information, click the OK button to establish a connection. If your login is successful the FTP window will open (seen below in next graphic) and the folders on the remote server will display in the right window. The folders and drives on your computer display in the left window. For each connected computer two areas display, the upper text boxes display the folder trees (directories) and the lower panes display the contents of the selected drives or folders on each computers. In this view the WS_FTP window is reduced to create a smaller graphic. You can maximize and size the window. The Remote Site server address will appear in the title bar. In the Remote Site contents window, the www folder contains materials available on the World Wide Web. The other folder cannot be accessed online. Your server may be different. The next step is to locate and select the file or folder you wish to transfer. The following graphics illustrate a connection to a computer using its IP number. In the graphic below the "C:\File Transfers" folder opened by default upon launching. The WS_FTP program works very much like Windows Explorer. 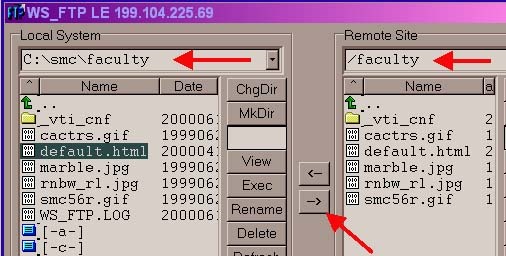 You can drop and drag files and folders from one window to the other window or to a specific folder, thereby copying files or entire folders from computer to computer. It is usual practice for a Web site's creator to maintain a mirror of a web site or web folder on their own work station computer. I recommend placing a mirror copy of your Web site on both your office and home hard drives (plus backup storage). To do this you need only select a folder in the Remote Site window and drag and drop it on the Local System folder of choice. This will result in a folder on your computer with the same name as your Web site folder, complete with all your folder's files. You can then edit the files on your computer or add files as needed. After you complete changes to your web pages or graphic files on your drive you simply send a copy of all modified and added files to the server, replacing any previous versions. Dragging and dropping is only one method of moving files. In WS_FTP, there are two directional buttons between the Local System and Remote Site panes. You can select the file or folder to be transfered by clicking on it, and then just click the appropriate directional button. Be certain that you have selected the destination drive or folder also. In this example the Remote Site folder "writing" is selected and ready for transfer to the "C:\smc" folder on a Local System. Notice that the "smc" folder has no contents, so the choice of drives on the Local System are visible, rather than below a long folder contents list. You can also select several items to transfer at once. The next graphic illustrates the result of the transfer. 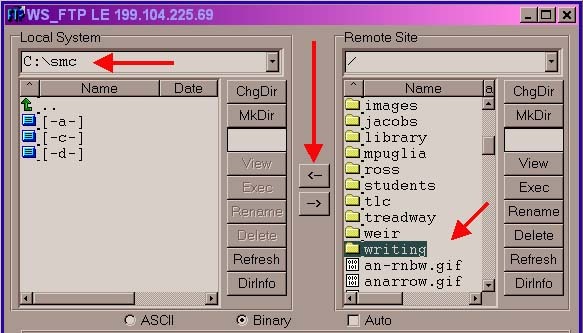 On the Local System the "C:\smc" folder now contains a folder called "writing," a mirror of the "writing" folder on the Remote Site. To move up the folder tree and see the contents of the C drive (in this case) you double click the green arrow in the Local System file window. The contents of C drive will then display in place of the contents of the "smc" folder. The [-c-] and other drive icons will still be displayed at the bottom of the same window. Double-click any folder or drive icon to display its contents. The next example, below, illustrates sending a selected file, in this case "default.html," from the open folder, "C:\smc\faculty," to the Remote Site "faculty" folder. This can be accomplished by clicking the transfer arrow or dragging the file icon from window to window. When you drag a file from window to window you can place it in the folder (window) or drop it on a specific folder in the open folder. Dropping a file or folder onto another folder will open that folder in the pane and place the dropped item(s) into the folder. Be sure to distinguish between dropping in the window and dropping on a folder. These two actions result in different placements of the item(s) transferred. To view and verify the changes on the Remote Site server, use your browser. You may need to select the reload or refresh button if you have already viewed the page online once during the same or a previous session. Good luck maintaining your Web pages.